The CFD Vision 2030 Integration Committee (CFD 2030 IC) was established to promote a community of practice engaged in developing methods, models, physical experiments, software, and hardware for revolutionary advances in computational simulation technologies for analysis, design, certification, and qualification of aerospace systems. 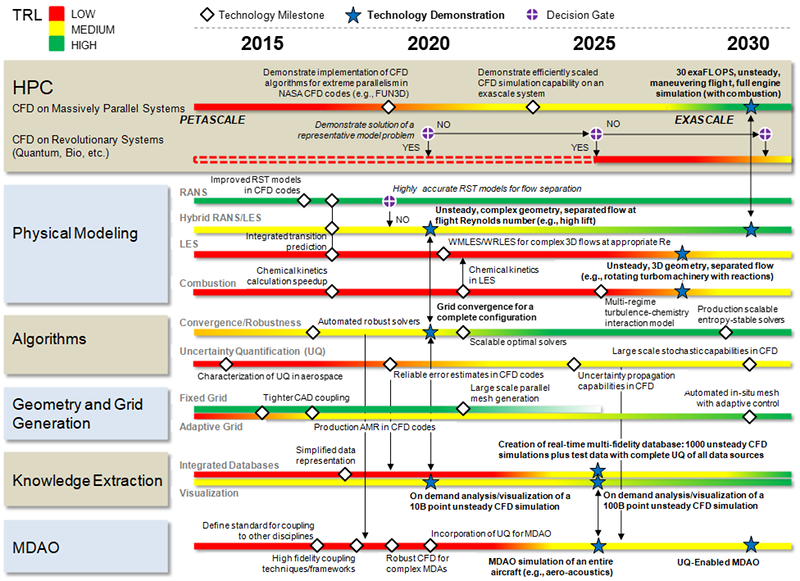 CFD 2030 IC serves as the focal point for activities to achieve the 2030 Vision by leveraging and integrating enabling technologies such as high-performance computing, physical modeling, numerical methods, geometry/grids, validation quality experiments, multidisciplinary analysis and optimization, with quantified uncertainties. CFD 2030 IC will communicate with other Committees to assure that the AIAA membership engages with their peers and external constituencies in shaping the future of simulation-based engineering. More information about AIAA's Integration and Outreach Committees can be found at www.aiaa.org/IOD. There will be a special session at AIAA Aviation 2019 on five years of progress toward the CFD Vision 2030. Read more. The CFD 2030 Vision Study included a roadmap for development of technology in each of the five areas deemed challenges to timely achievement of the vision.